It is always nice to add our first few bookmarks to our browser. But after a few weeks, it is very likely that they will have lost all their usefulness. In big lists of bookmarks, it is very difficult to find the ones that refer to our favorite sites, and it is even possible that some of them are duplicated. But that is not all it does. 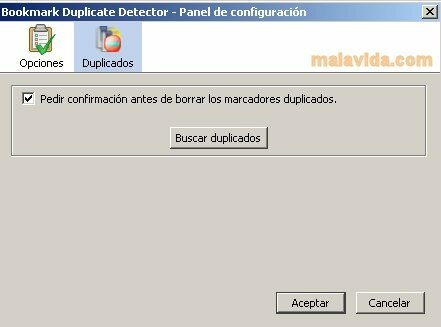 This plug-in is capable of letting us know when we are about to add an existing bookmark and indicate the URL that we had already added in advance. 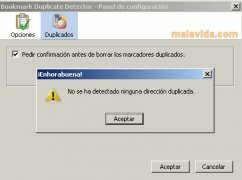 Furthermore, we can configure it to automatically delete duplicated bookmarks, or on the contrary, we want to receive a warning for each case before eliminating them. 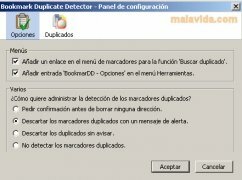 Detect and remove duplicate bookmarks in a fast and automatic manner. 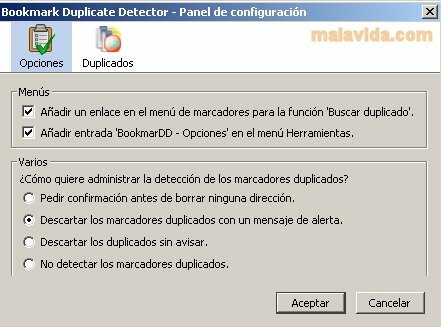 Keeping our bookmarks organized is essential because otherwise, they lose all usefulness, and Bookmark Duplicate Detector will help you managed just that. So, download this extension and check it's efficiency.